“Customer ” means the purchaser of Goods from the Company. “Goods” means all goods, parts, items or services sold and/or delivered by the Company to the Customer. "Special Order" means the Customer requests the Company to purchase Goods on behalf of the Customer. These Terms apply to all contracts for the sale of Goods by the Company. No amendment, alteration, waiver or cancellation of any of these Terms is binding on the Company unless confirmed by the Company in writing. Prices are determined at the time of order and, prior to payment of the deposit (if required), are subject to change without notice. Payments are to be made to the Company without any deduction or discount other than as stated in these Terms or in the relevant invoice or statement. A deposit of 35% of the invoice price must be paid when placing an order or as negotiated with the Company. Where Goods are ordered that require custom fabrication or expedited supply, the Goods must be paid for in full at the time of ordering. The balance of the invoice price must be paid in full before delivery or by mutual agreement between the Customer and the Company. Interest is payable on all overdue accounts calculated on a daily basis at the rate of 1.5% per month as from the date due for payment until payment is received by the Company. Special Order items must be paid for in advance. The Customer must, within 5 days of being notified of their availability, collect or accept delivery of the Goods and pay the balance of the invoice price. In addition to clause 4.4, the Company reserves the right to charge the Customer storage on goods not collected or delivered within 5 days of notification of their availability at the rate of $35.00 per week or part thereof. The Company reserves the right to deliver the Goods in whole or in instalments, as well as to deliver prior to the date for delivery and, in such event, the Customer must not refuse to take delivery of the Goods. Any failure on the part of the Company to deliver instalments within any specified time does not entitle the Customer to repudiate the contract with regard to the balance remaining undelivered. Legal and beneficial ownership of the Goods will not pass to the Customer until such time as the Goods have been paid in full in cash or cleared funds. The Goods are entirely at the risk of the Customer from the moment of shipment to the Customer’s point of delivery or on collection, even though title in the Goods has not passed to the Customer at that time. The Customer must, at its own expense, maintain the Goods and insure them for the benefit of the Company against theft, breakdown, fire, water and other risks as from the moment of delivery to the Customer and until title in the Goods has passed to the Customer. Unless the Customer has inspected the Goods and given written notice to the Company within 2 days after collection or delivery that the Goods do not comply with the relevant specifications or descriptions, the Goods are deemed to have been accepted in good order and condition. No order may be cancelled, modified or deferred without the prior written consent of the Company (which is at the Company’s sole discretion). If such consent is given it is, at the Company’s election, subject to the Company being reimbursed all losses, including loss of profits, and paid a cancellation fee (being not less than 20% of the invoice price of the Goods). "Special Orders" cannot be cancelled under any circumstances as the Customer understands that they have requested the Company to purchase the Goods that may entail the Company paying for the Goods and other additional shipping, transportation and administration charges. (b) payment of the cost of replacing or repairing the Goods or of acquiring equivalent goods; and in either case, the Company will not be liable for any consequential loss or damage or other direct or indirect loss or damage. The provisions of any act or law (including but not limited to the Trade Practices Act 1974) implying terms, conditions and warranties, or any other terms, conditions and warranties which might otherwise apply to or arise out of the Contract are hereby expressly negatived and excluded to the full extent permitted by law. Any display product or sample inspected by the Customer is solely for the Customer’s convenience and does not constitute a sale by sample. The terms of the Contract are wholly contained in these Terms and any other writing signed by both parties. The Contract is deemed to have been made at the Company’s place of business where an order was placed and any cause of action is deemed to have arisen there. From time to time, the Company will offer discounts in the form of Vouchers. These Vouchers will enable the Customer to enter a unique code that will provide the discount. In order for the Voucher to be valid, it MUST be entered at the time of placement of the order via the Company's website. No other method of supplying the Voucher code is permitted. From time to time, the Company will offer Sales and other Promotions in the form of percentage based or fixed amount discounts. 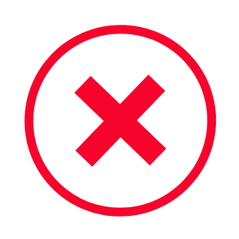 Unless stated otherwise, the following items or any item displaying a "red X" in the top right hand or top left hand corner of the image as shown below will be excluded from any stated discounts: services, used parts, engines, transmissions, Special Order Goods and Goods that are not currently in stock. In addition, Goods that are already discounted, Shipping and other ancillary labour based services such as machining, assembly, match porting etc are also excluded. Goods displaying a red "X" in the top right hand corner of the product image, as shown, will be excluded from ALL discounts. The Company has the right to terminate the Promotion at any time without prior notice. Trade Customers are excluded from any and all Sales and Promotional discount pricing. From time to time, the Company will offer Sales and other Promotions in the form of percentage based or fixed amount discounts. The Customer MUST pay for the discounted item(s) within 24 hours of the Customer receiving the invoice from the Company otherwise the Company reserves the right to remove the discount and charge the Customer the full retail price for the item(s). Before returning any Goods, you MUST contact the Company via telephone or email otherwise your returned Goods will NOT be accepted. The Customer must meet the total cost of all shipping relating to the returning of the Goods to the Company. Returned Goods must not have been fitted and must be in the original and unmarked packaging and in a re-saleable condition (unless faulty). Goods that have been painted or modified cannot be returned. Returns are not possible on tools or electrical Goods that have been fitted, unless they are found to be faulty. Whilst we make every effort to provide accurate information, it is the Customer's responsibility to check that the Goods are correct for their vehicle before fitting. "Special Order" Goods require full payment at the time of the order being placed. Cancellations and returns are not possible for tailor made or personalised Goods unless faulty or incorrectly supplied. A restocking fee of 10% will be deducted from the original invoice price of the Goods only. All Returns will be at the discretion of the Company and will be issued in the form of a "store credit" for future purchases. No refund will be provided.